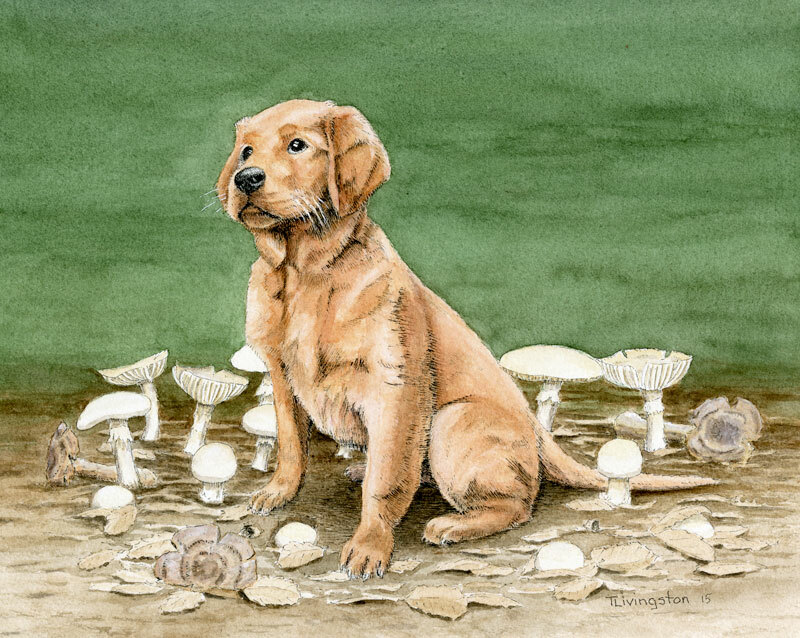 This entry was posted in Drawing, Pen and Ink, Traveling Companions, Watercolors and tagged golden retriever, poisoning, puppy by foresterartist. Bookmark the permalink. The picture of Bliss amongst the mushrooms gives me chills knowing what you and Mary have done to save beautiful little Bliss. I just read Mary’s story; your illustration is stunning. I will keep sending prayers for Bliss while she continues to heal and grow. We appreciate that Jill. We’re still hoping for the best. Lovely portrait of Bliss. I have read the story, may she continue to recover. Thank you so much Dina! She’s doing well. In fact, I brought her to work today. Uh oh. Guess I better go read your wife’s post! Fantastic drawing! Beautiful drawing! I’ve read also Mary’s story, very nice post! I hope Bliss is in the clear now. You and Mary are so loving! She is doing pretty well. We just don’t know how much long term damage may have been done to her kidneys. There could be some effect to her quality of life, but right now things appear good with her. So happy that Bliss recovered! Beautiful drawing! Thank you Simla. We pretty happy with how well she’s doing. Love that painting of Bliss and I’m so glad that saga ended well! Thank you Teresa, as are we. I love happy endings!! So glad for you and Mary that little Bliss survived such an ordeal. I love your watercolor portrait of her too! Thank you Sally. We are glad to be at this end of the ordeal. Amazing parents young Bliss has in her life – just read Mary’s story and am so thankful to also read that Bliss is finally recovering so nicely. It helps to have the two most incredible dog parents out there. So happy to read that she is back at being what young pups do, play then get bushed and start playing all over again! Wonderful painting Tim! Thank you so much for your kind words Mary. She’s feeling so good that I have to start reining her in, but that’s a good problem to have. A total relief, right? Great to read the news – hope you all have a great weekend. Incredible story. Glad she decided to stick around. Holy cow, I can’t believe she is still with you both after eating an aminita mushroom. Thanks to Mary for posting such an amazing account of what you all are going through. I have my fingers crossed for Bliss to continue her recovery! Oh my goodness. What a terrible ordeal for everyone. I am so glad that she is recovering. I had no idea mushrooms were so dangerous, so thank you for the information. I am so glad she is still around for you to draw such an lovely picture of her. Thank Ruth. It has been an ordeal and we’re so relieved that she’s doing so well now.